Leave a Comment on If you can’t do, critique! 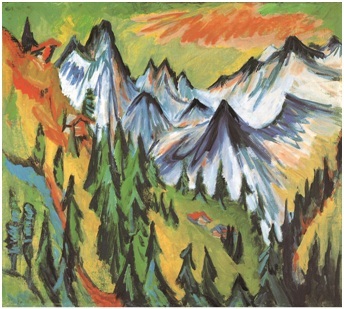 Ernst Ludwig Kirchner, Top of the Mountain, 1918. Oil on canvas, 79.5 x 90 cm. If you were, however, to venture out of your comfort zone and introduce your talent to the world, wouldn’t it be nice to already have a critic in your corner? That’s exactly how it went down for Altenbourg, Bacon, Braque, Kandinsky, Kirchner, and Klee. These men, members of Die Brücke through Art Informel (a branch of Bauhaus) and everything in between, were tirelessly supported by the one and only Will Grohmann – a German art critic and enthusiast – for over fifty years. That’s a long time to say nice things about a person, friend or not. 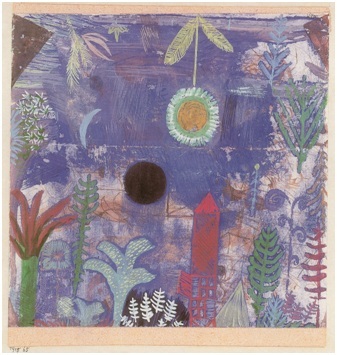 Paul Klee, Engulfed Landscape, 1918. Watercolour, gouache and ink on paper on cardboard, top and bottom borders in satiny paper, 17.6 x 16.3 cm. And while I do find Grohmann rather biased in his shameless support of his mates, I greatly admire his collection of correspondence. Having over 2500 pen-pals, I imagine Grohmann was quite busy writing letters, post cards, and, of course, his artistic criticisms. It’s really a pity that our own generation has found it nearly impossible to hold on to the beauty of the hand-written letter. Feel free to sit down and write me a hand-written letter anytime, and I promise to respond in the same form. However, in the meantime, head over to the Staatliche Kunstsammlungen Dresden, now through 6 January 2013, to see In the Network of Modernism and admire the same works that captivated one of the most influential art critics of the 20th century. When that’s not enough, order these colourfully illustrated ebooks: Kirchner by Klaus Carl, Klee by Donald Wigal, and Kandinsky by Victoria Charles.